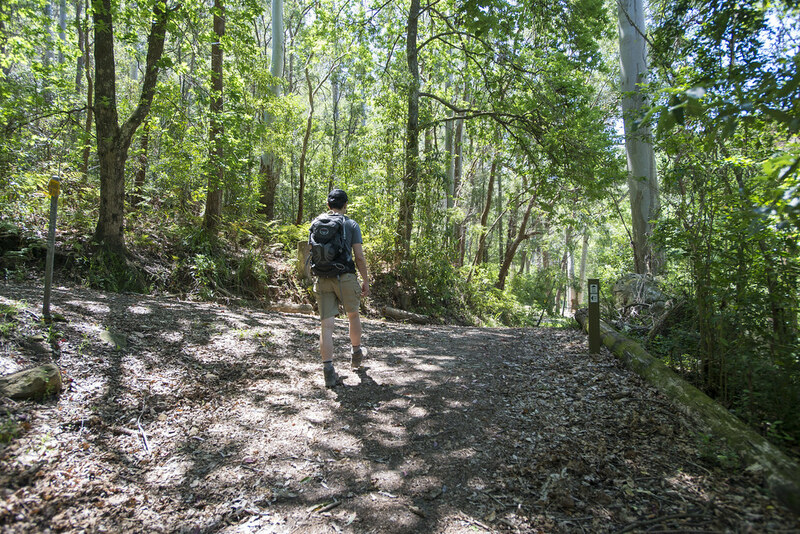 The Blue gum walk (Joe’s Mountain Circuit) begins at Hornsby Park, listed on Google Maps as Rosemead Rd Picnic Area. There is free parking along Rosemead Rd. 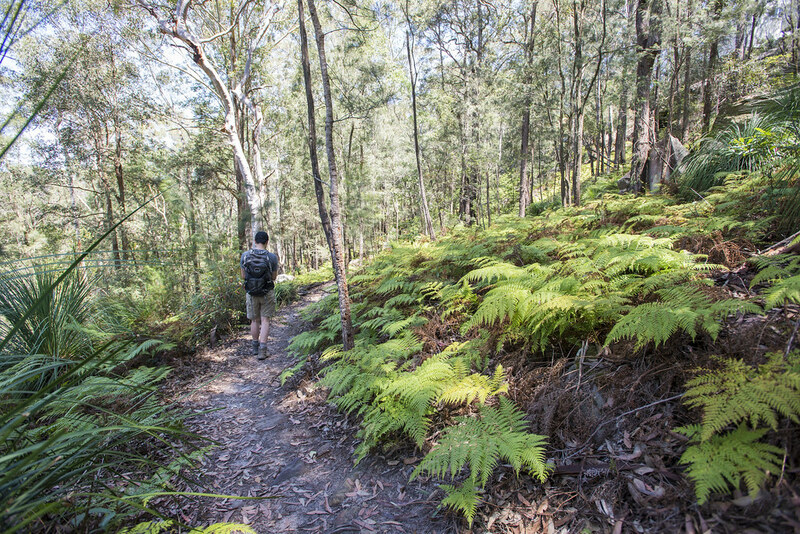 If catching public transport, the closest train station is Hornsby Train Station and the beginning of the walk is an approximate 20 min walk from the station. The walk starts on the the left side of the entrance of Hornsby Park on Rosemead Road. 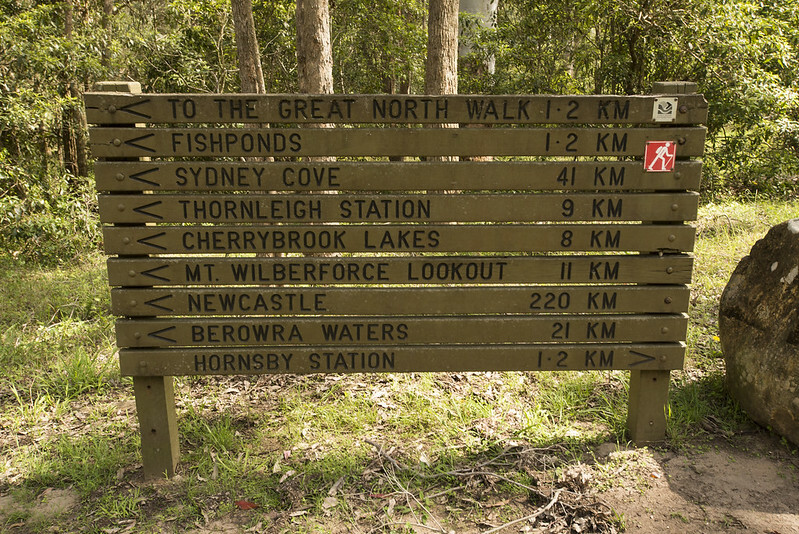 Follow the “Fishponds 1.2km” arrow on the large sign, walking past the fire trail gate. 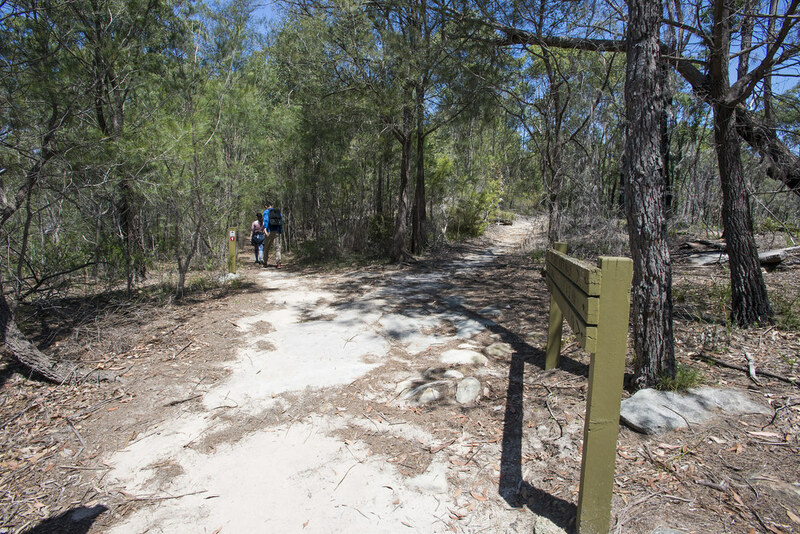 The walk heads downhill on the fire trail, with residential homes to the left. 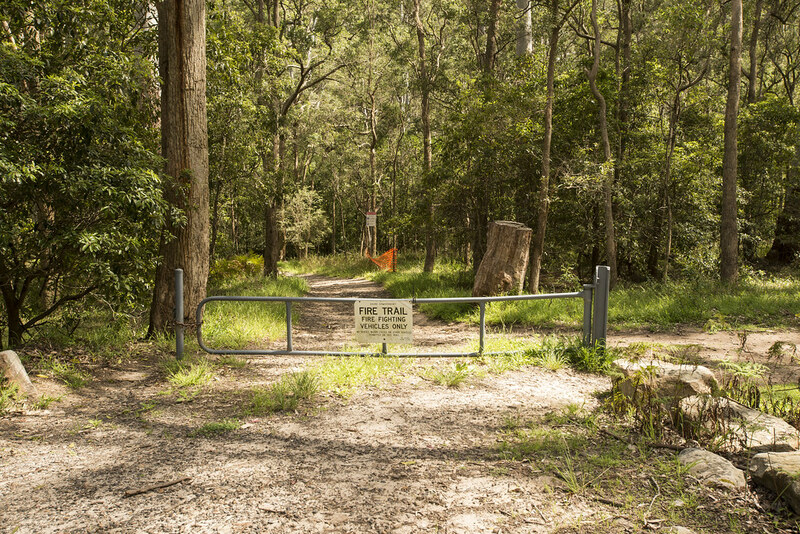 Turn left at the top of the hill at the next Blue Gum Walk sign post, avoiding the trail on the right. 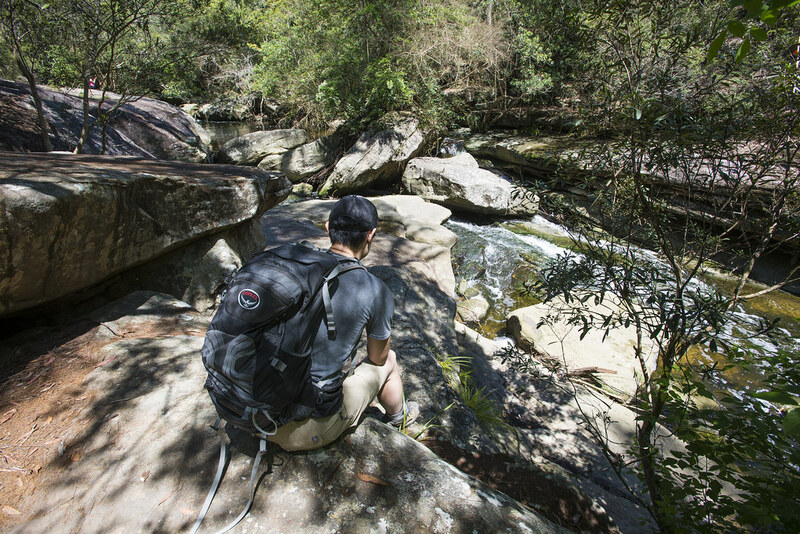 The walk then crosses Old Man’s Creek with circular concrete stepping stones before bending right and continuing moderately uphill. 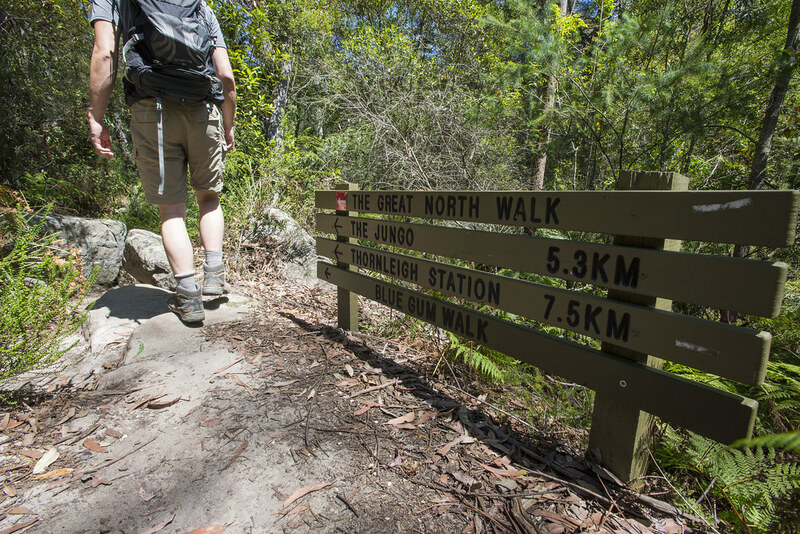 Follow the Blue Gum Walk sign post to continue straight and the top of the hill. 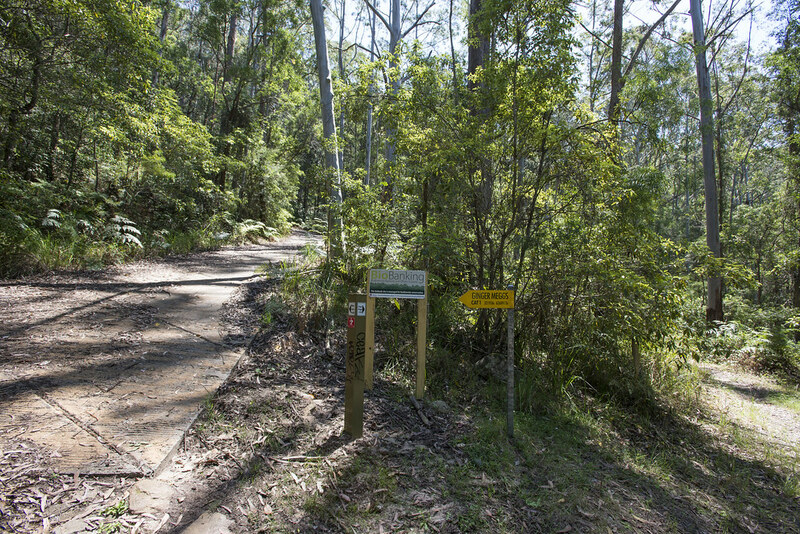 Turn left at the top of the hill at the next Blue Gum Walk sign post, avoiding the trail on the right. 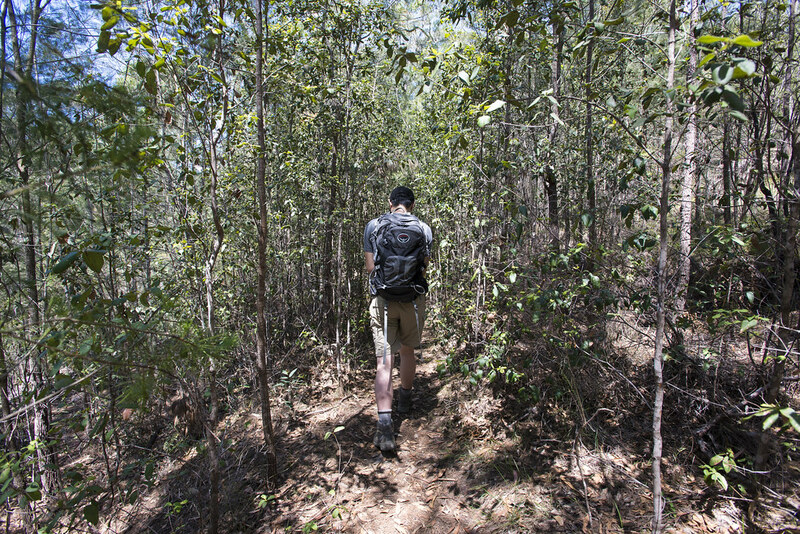 The walk continues gently downhill to the turpentine forest with large boulders on either side before reaching a fork. 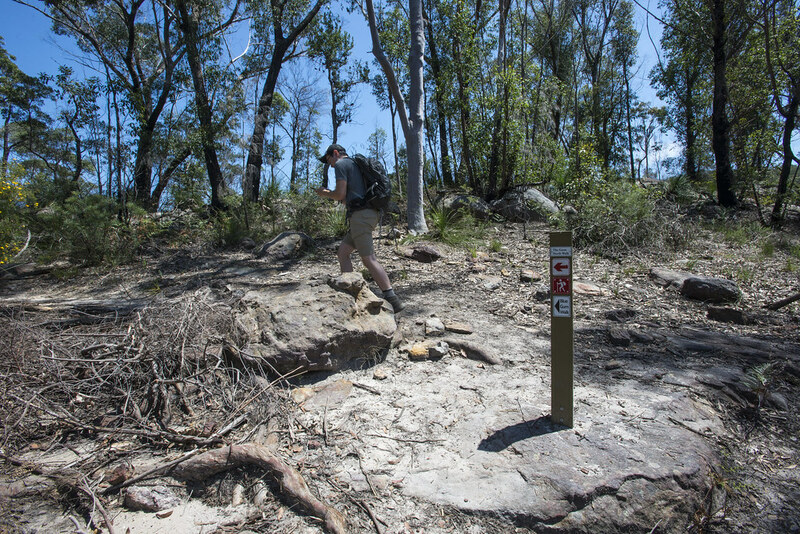 Veer right at the fork to follow the Blue Gum Walk sign post until reaching another sign post shortly after. Follow this sign post to the right and down the stairs. Continue straight at the large green sign, following the arrow for “Fishponds 300 M”. The track becomes narrow with a hand railing on the right side. 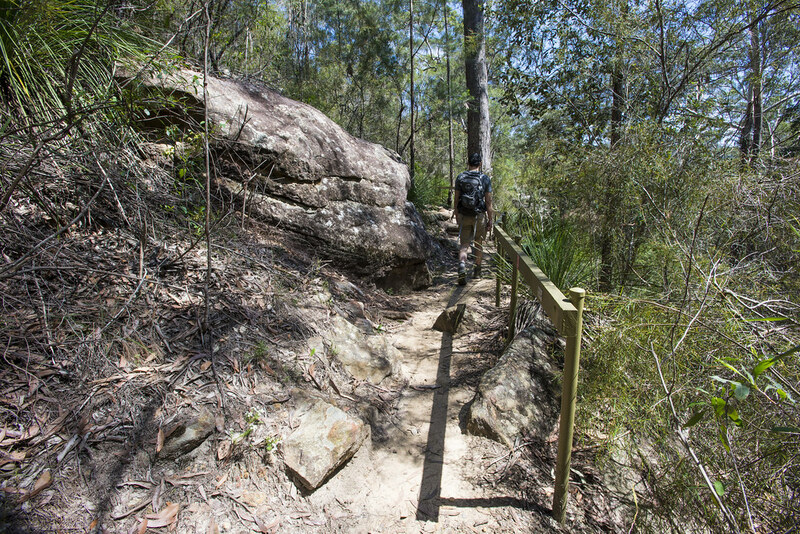 Continue down carved rock stairs and walk over a wooden bridge. 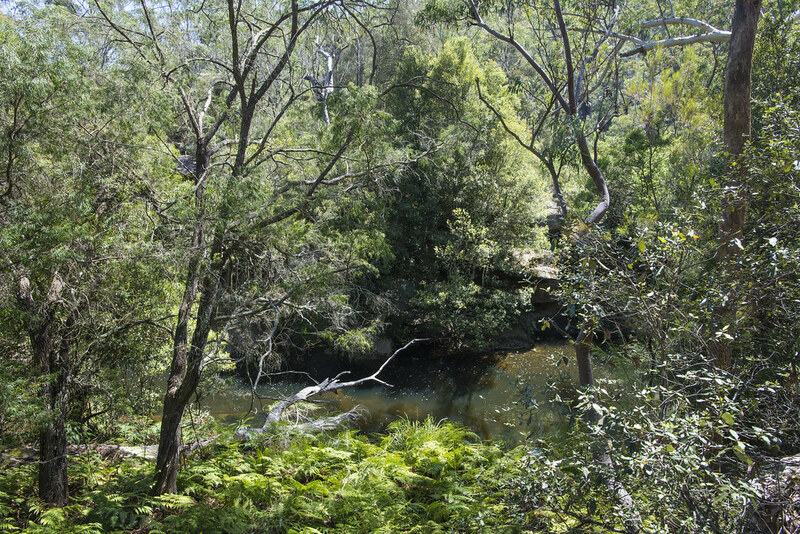 The walk reaches Fishponds Lookout, a fenced rock platform. 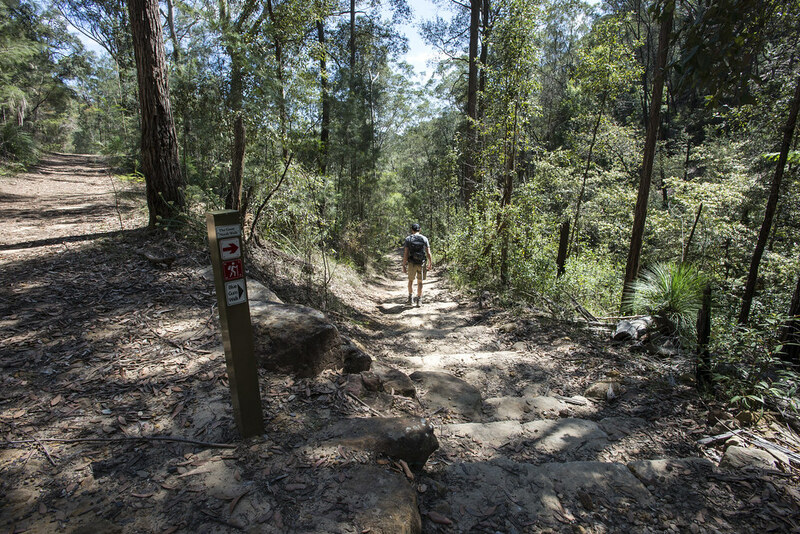 At Fishponds lookout turn left to follow the signs for the “Blue Gum Walk”. The walk continues downhill and crosses a small wood bridge covered in debris, before continuing uphill and to the right. 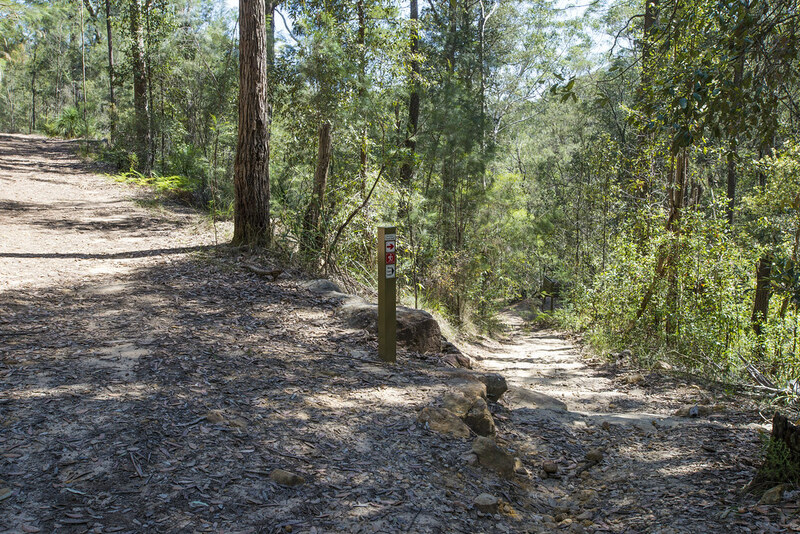 The track becomes rocky, with Berowra Creek on the right side. 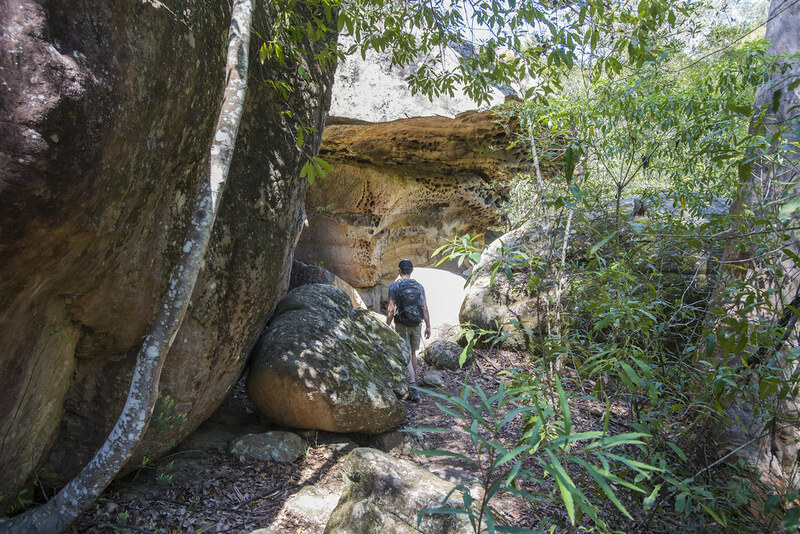 The trail continues with rock scrambling and walking under a large overhanging sandstone rock feature. 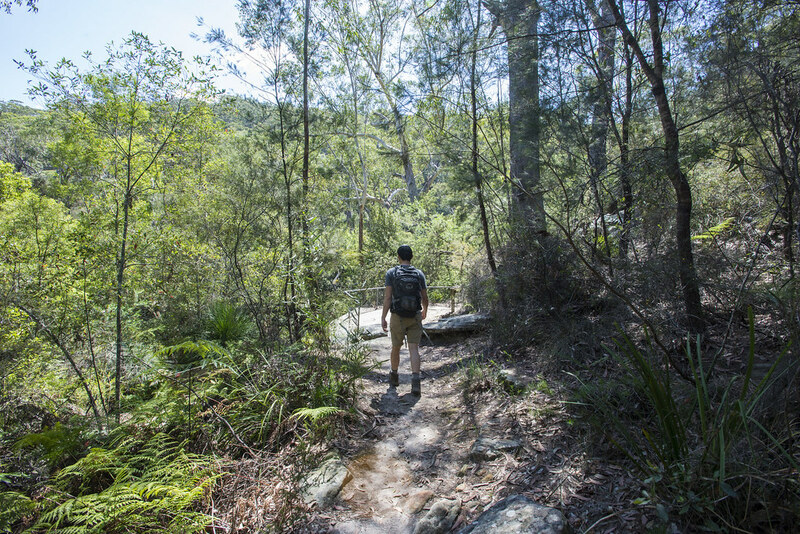 The walk continues alongside Berowra Creek with cascades on the right. Follow the arrow markers and climb up and through the U shaped tree. 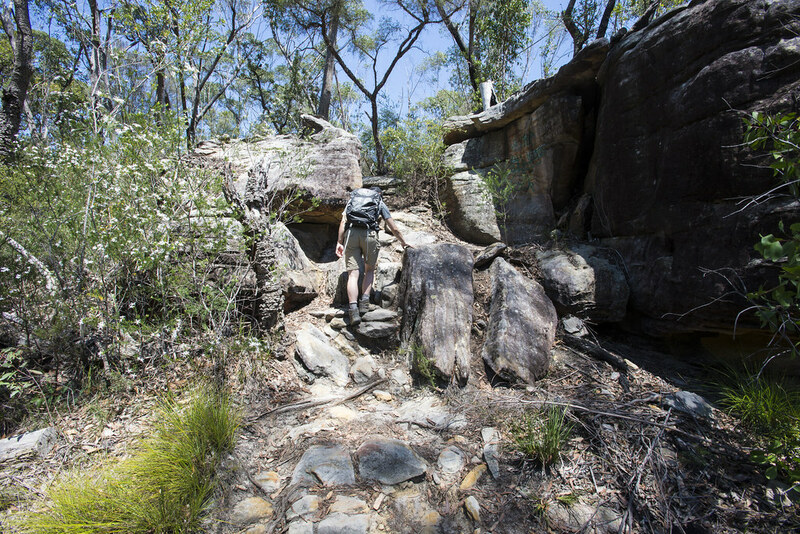 Continue along the rocky path until reaching a rock-based creek crossing known as the “Spa” marked by a Blue Gum Walk sign post. 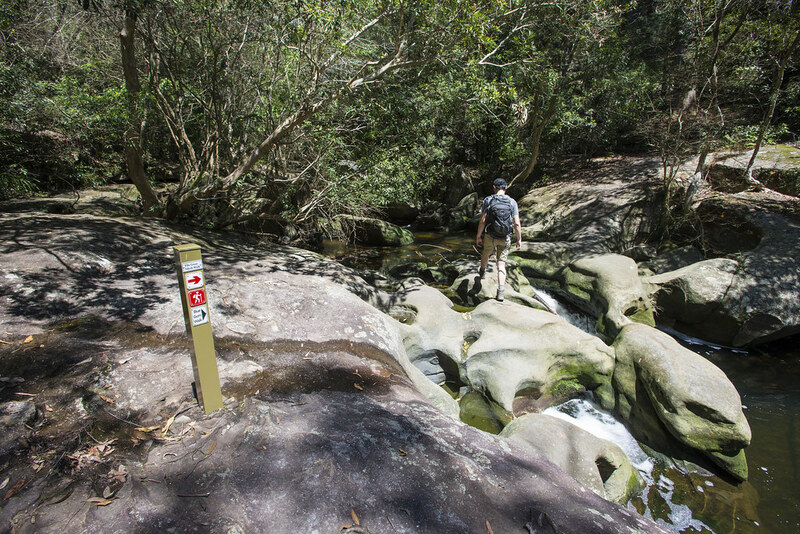 Take care crossing the Spa as the rocks may be slippery and the numerous holes in the rock require careful footing. 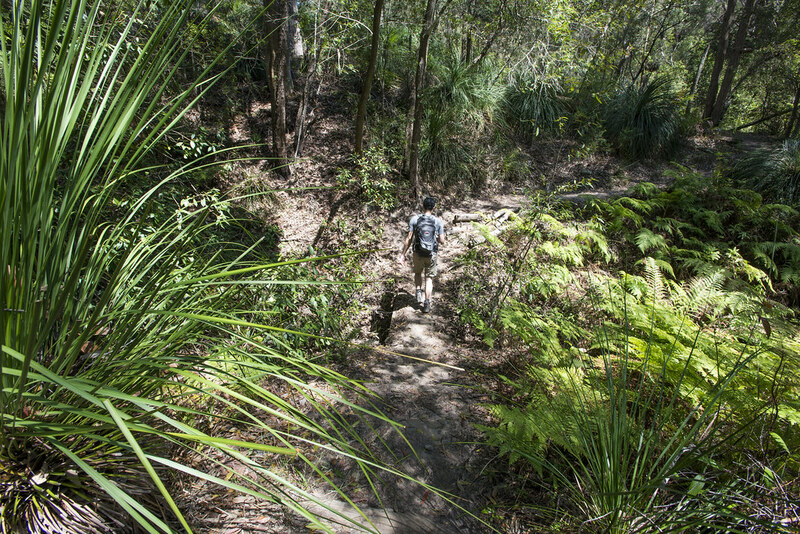 Crossing the Spa over Waitara Creek, continue up stairs between two trees as the trail turns right. 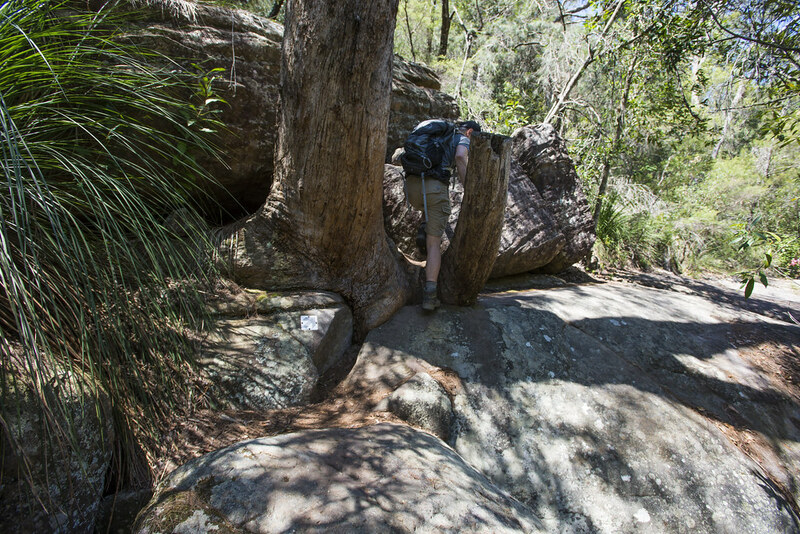 Continue uphill wrapping left to reach a Blue Gum Walk sign post. 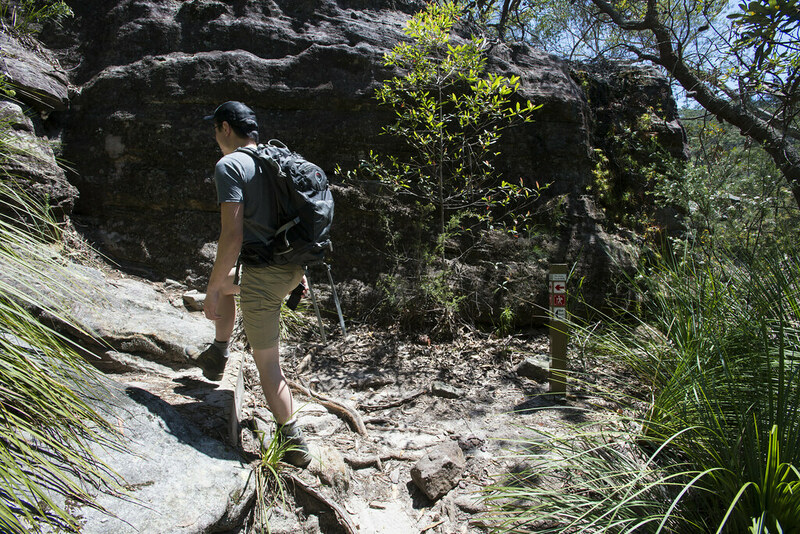 Follow the sign post to continue uphill climbing over rock stairs and between rocks, until reaching another Blue Gum Walk sign post pointing left. Turn left at the sign. The track continues gently down hill onto flat sections with a valley on the right. 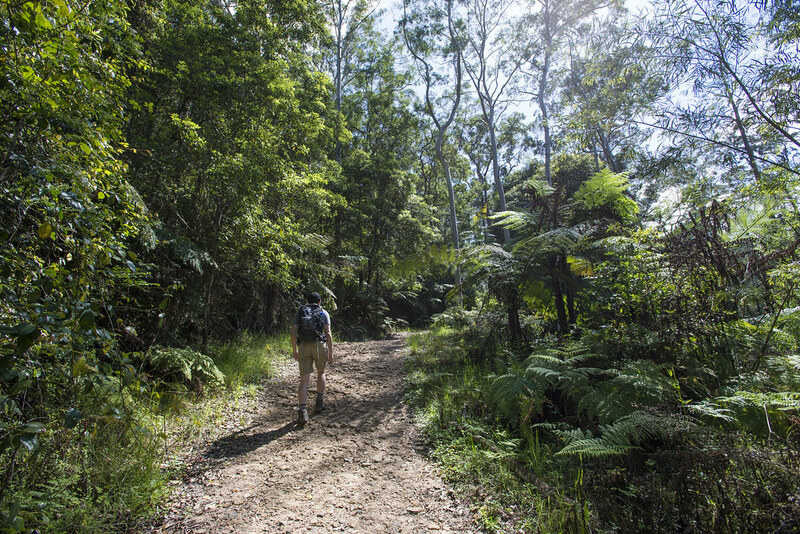 The walk continues until reaching a large green sign with a fork in the trail. 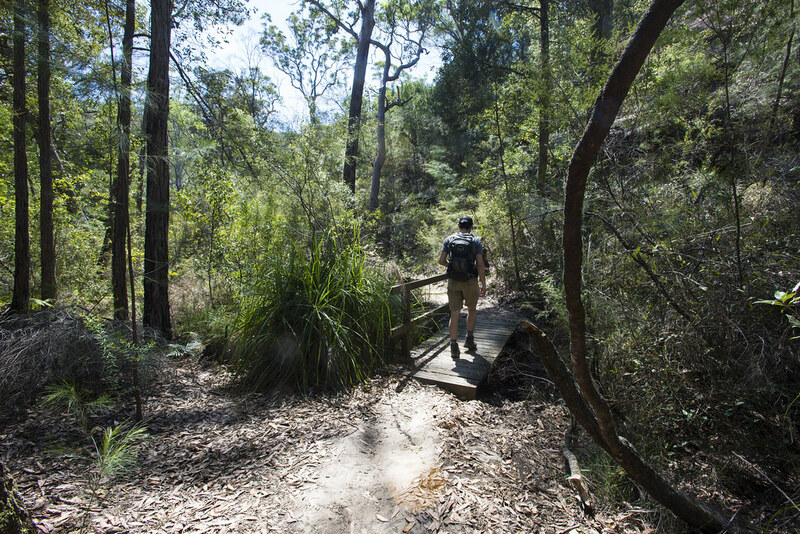 At the fork veer left to follow the Blue Gum Walk sign post. The path narrows, bordered by trees on both sides. 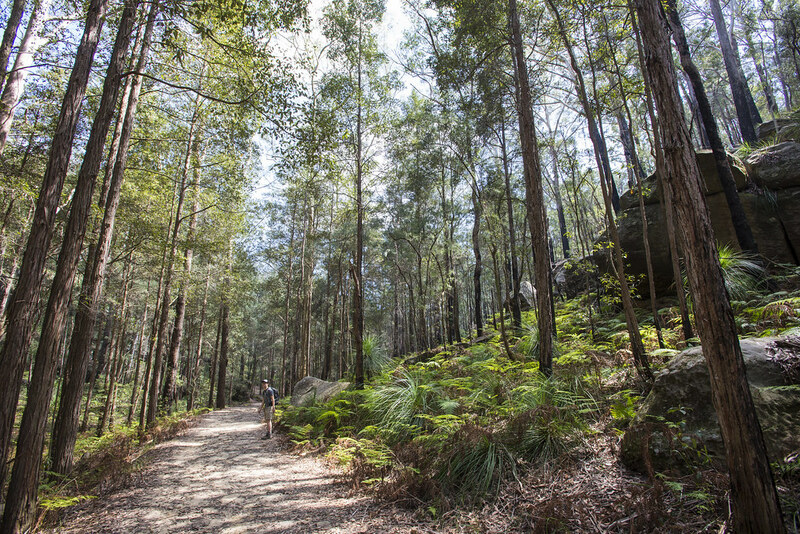 Continue slightly uphill as you reach the Blue Gum forest with residential homes perched on the hill on the right and valley to the left. 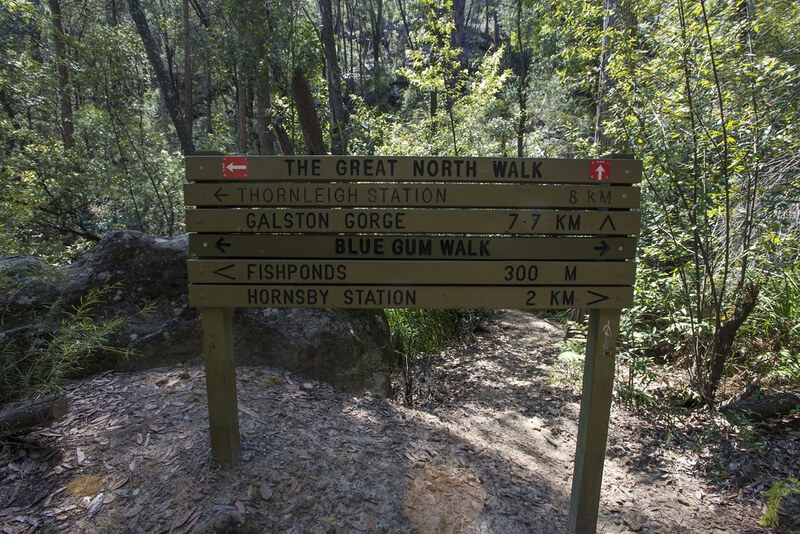 The walk comes to an intersection with Blue Gum Walk sign post. Turn left at the sign post onto a wide concrete trail. 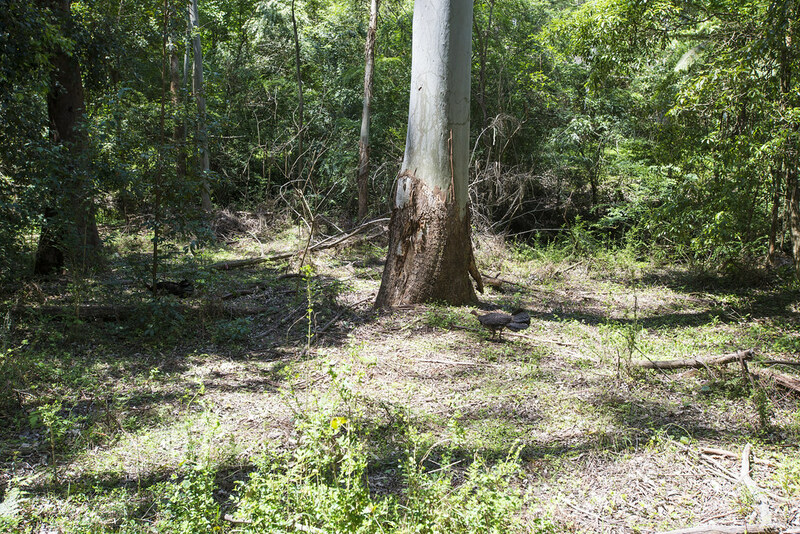 Keep an eye out for the Australian brushturkey, or commonly referred to as bush turkeys, in the area. 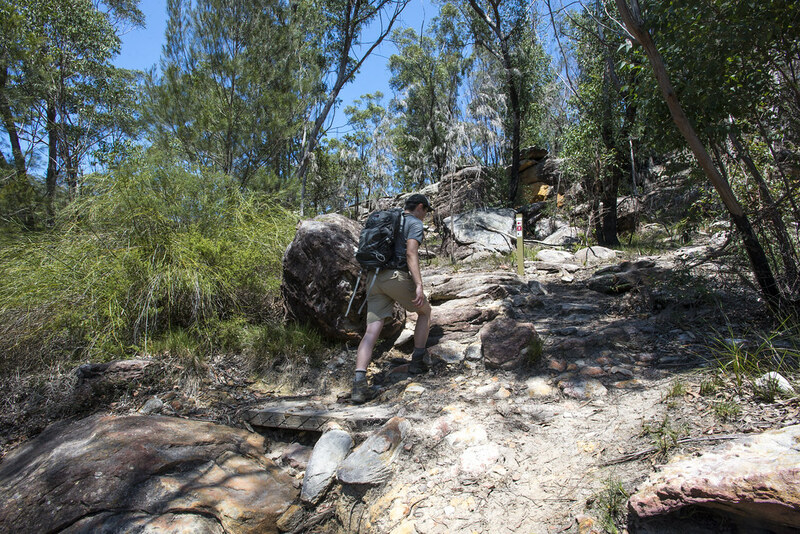 The walk continues steeply down hill until reaching another intersection. Continue straight from the intersection. 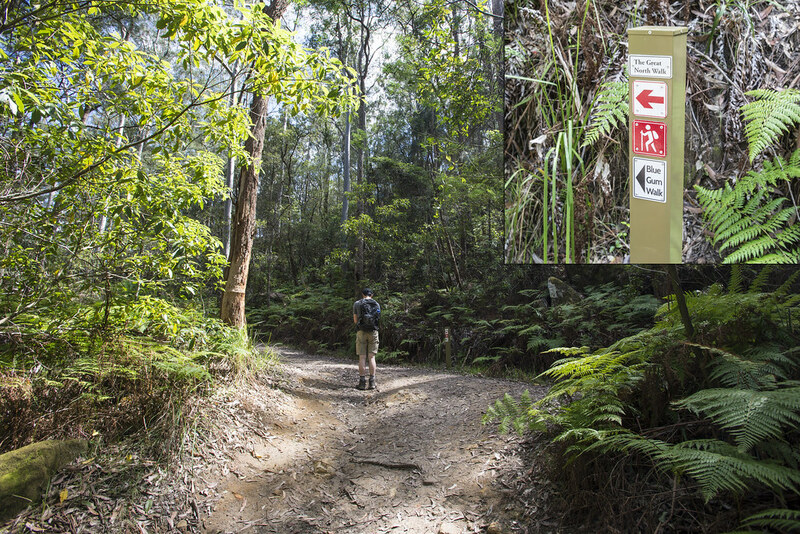 Following Blue Gum Walk sign posts until reaching another intersection at the top of a gentle uphill section. 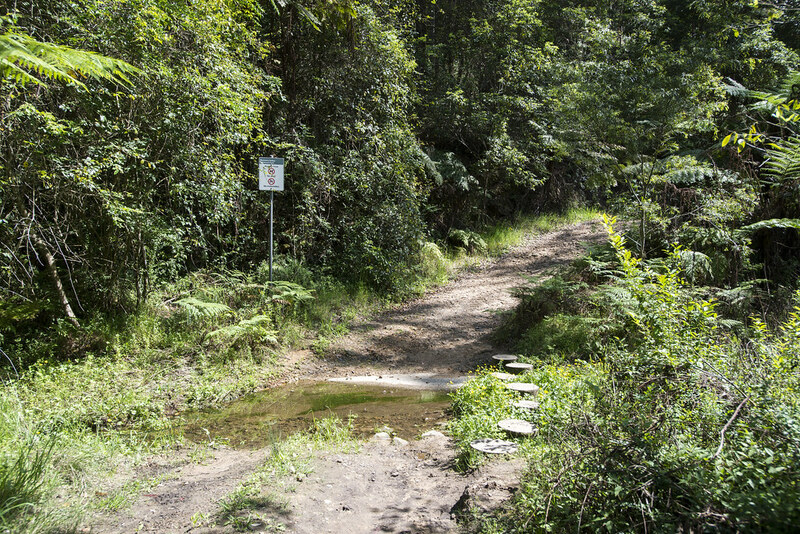 Walk straight at the intersection following the Blue Gum Walk sign post, ignoring the Ginger Meggs Loop track to the left. 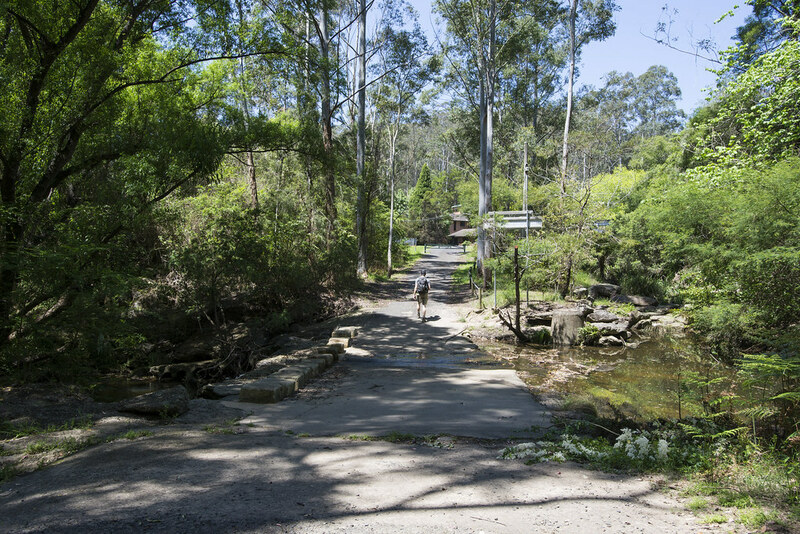 Continuing straight the walk bends to the right and crosses Waitara Creek over a concreted causeway with stepping stone on the left side. 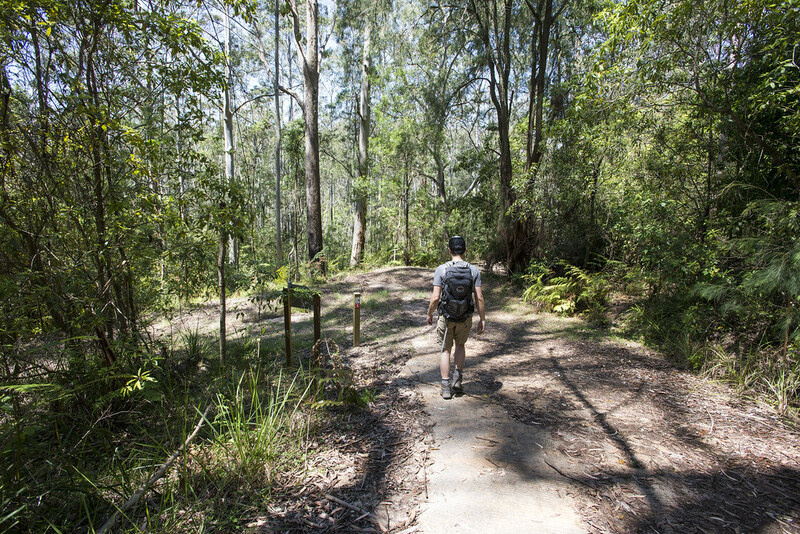 After crossing Waitara Creek, the walk continues uphill to a gate before moving onto Valley Road. Turn left onto Valley Road, passing Ginger Meggs Park on your left hand side. Continue straight until reaching Rosemead Road. 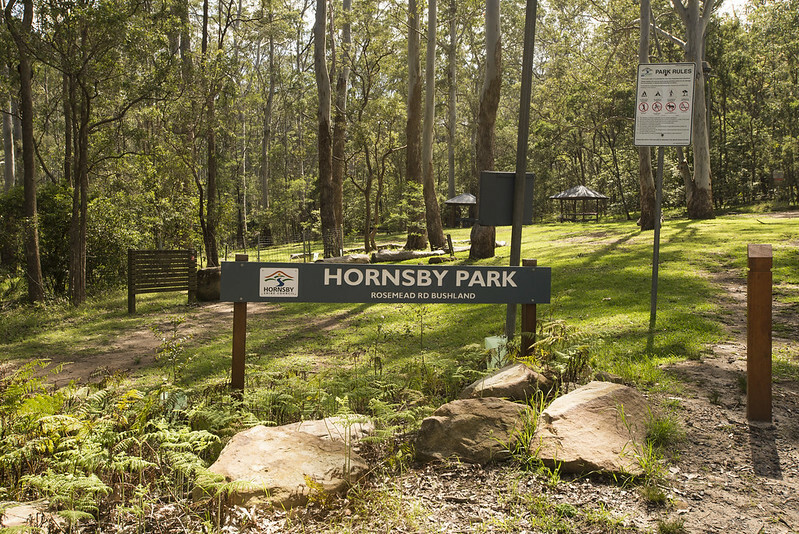 Turn left and walk straight to return to the starting point at Hornsby Park on Rosemead Road.